Western Region- the Vital Statistics! Vital Statistics for 2015 have just been released by the CSO with detail of birth and death rates available at county level. It is interesting to look at how these vary by county and the significant differences that can be seen, usually related to the age structure of the county populations which in turn is often related to the rurality of the county. There were 65,909 births in the state in 2015 of which 16% (10,527) were to mothers resident in the Western Region. 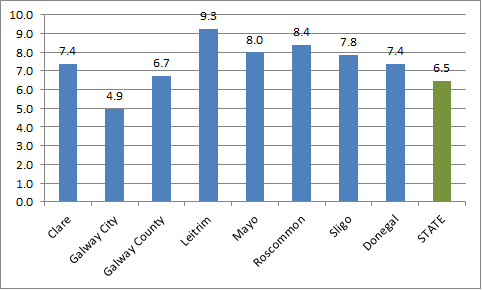 The birth rate (Births per year per 1,000 population) nationally was 14.1 with the highest rate (17.4) in Fingal and the lowest rate in counties Roscommon and Kerry (11.8). The birth rate in the counties of the Western Region is shown in Figure 1 above. 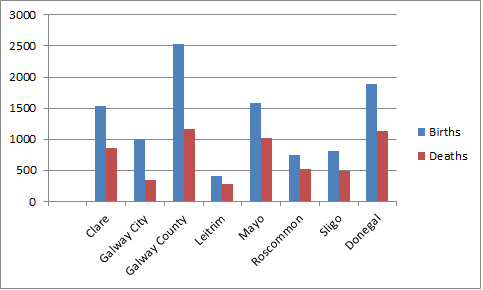 All counties with the exceptions of Galway (City and County) had lower birth rates than the national figure. Not surprisingly (given the older population in the Western Region) the death rates in the Western Region counties tend to be higher than the national figure. In 2015 the national death rate was 6.5 deaths per year per 1,000 population. 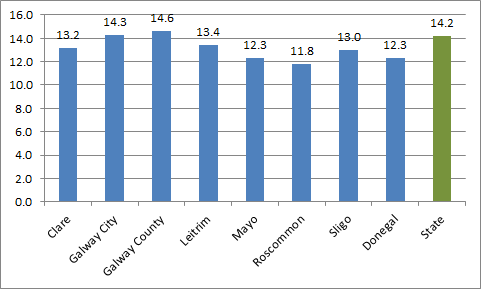 All Western Region counties, with the exception of Galway city (4.9) were higher than this (see Figure 2 below) with the highest rate 9.3 in Leitrim. The difference between the number of births and deaths in each county gives the natural population increase for that county. This does not include population changes associated with migration. Natural population increase for the State and the Western Region is shown in Table 1 below. The difference between births and deaths in each county is shown in Figure 3 below. More detailed demographic information for each county will be available next year when the results of the 2016 census are published. It will then be possible to examine the age profiles and demographic trends in each county and to consider the longer term implications of the changing demographics.